It’s not quite “the day the music died,” but some might feel that way. After 30 years of residence in the Noe Valley Ministry, the Noe Valley Music Series will take its tunes to NOPA in February, making a new home at St. Ciprian’s Episcopal Church while the Ministry undergoes a massive renovation. The Saturday-night series has attracted venerated musicians and thousands of listeners each year, though Kassin started it in 1981 as a venue for lesser-known bands like his jazz fusion quintet. Back then, Kassin, a flutist, lived on Alvarado Street near Sanchez, and he learned that the pastor of the newly revived Noe Valley Ministry was looking to host community events in its Gothic building at 1021 Sanchez Street. On Feb. 8, 1981, what was then called Noe Valley Jazz presented its first performance: the Bishop Norman Williams Quartet. 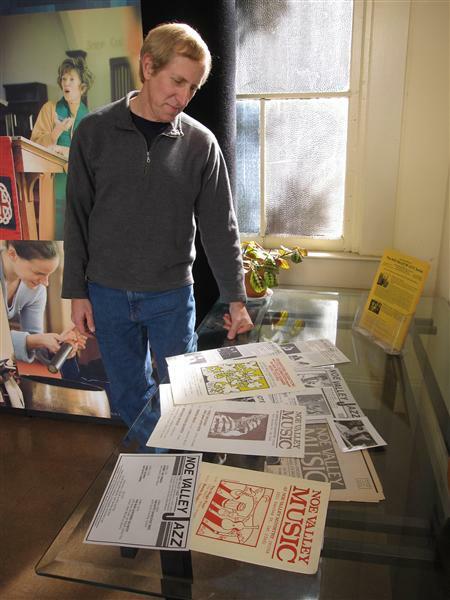 McFerrin, who lived on Valley Street, used the Ministry as his lab, and he returned even as his fame grew, Kassin said. “Around 1990, he did a full weekend at Noe, then the next week saw him on the Tonight Show, then the week after that he won a Grammy,” Kassin said. Ten-time Grammy-winner T-Bone Burnett, folk star Ramblin’ Jack Elliot, and Academy Award-winner Marketa Irglova (of the film Once) have all taken turns at the mike. Warren Zevon stopped there on an acoustic solo tour. The pair insisted Kassin remove chairs from the room so the audience would stand during the performance, and that didn’t go over so well. Joan Baez, on the other hand, twirled with a women’s dance class that had been double-booked into the concert space, then ran through a quick sound check to start her show when the class ended. Kassin has invited stars of other genres as well, like comedians Will Durst and Geoff Hoyle, performance artists Rho­dessa Jones and Opera Piccola, and musicians that range from Sudanese oud master Hamza El Din to master didgeridoo innovator Stephen Kent. In recent years, shows averaged about 60 guests, Kassin said, 20 percent of whom live in Noe Valley. Joe Cunningham, a former Sanchez Street resident who has been a regular for 16 years, credits Kassin with creating something rare. “I like seeing such great musicians in a small venue,” said Cunningham, whose first date with his wife was an Indonesian Gamelan orchestra concert there. Cunningham recently took his son to see his guitar hero, Bill Frisell. Ray Murray of Hill Street has been going to the concerts since the series began. Murray, too, cites the variety of music as a key attraction. He likes the social aspect too, he said—talking to other fans, hanging out on 24th Street before and after shows, and checking out the Ministry’s changing art exhibits. The shows at St. Ciprian’s, to be called SF Live Arts, may not be much different. The church is on Turk Street at Lyon and has 350 seats, about 100 more than the Min­istry, and excellent acoustics, Kassin said. Kassin has scheduled a series of farewell concerts in Noe Valley, including a Nov. 5 performance of his own trio, Manring Kassin Darter, and a Nov. 6 “Last Tango in Noe Valley” by Tango No. 9 and special guests. He hopes to schedule a final show on Saturday, Jan. 8, with Ramblin’ Jack Elliot. Tickets for Kassin’s trio are $14 in advance and $16 at the door. For Tango No. 9, the cost is $15 in advance and $17 at the door. Advance tickets can be bought at Phoenix Books, 3957 24th Street, and Kassin says he plans to continue selling tickets there for St. Ciprian’s shows.